We’re very proud of all the work our teams have done to bring Resolute to the podium for so many awards this year. And it’s especially gratifying to see that of the dozen honors we’ve either received or have been shortlisted for, six specifically recognize aspects of our work in sustainability. There’s no question this is the result of a great team effort but there’s an element of leadership here that is also important to recognize. And it is being recognized. Twice! Pascale Lagacé, our Vice President of Environment and Climate Change, was nominated not for one, but for two awards. 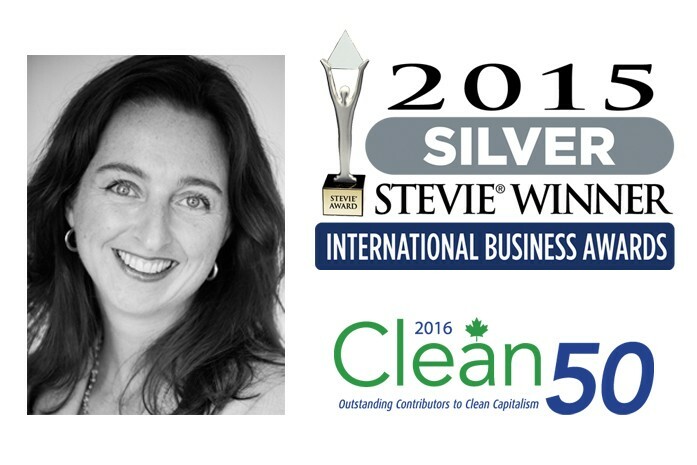 She’s been named to the prestigious Clean50 awards and she won a silver Stevie® in the International Business Awards’ first-ever Woman-of-the-Year category. The Clean50 is more than an award, it’s an appointment to a working group. Honourees from various industries, academia and government are recognized for the contributions they’ve made to thought leadership on sustainability in their areas – and they’re put to work. They gather at a one-day summit to engage with other sustainability leaders from all sectors of Canadian life each September where they participate in work groups designed to foster learning, collaboration, and engagement across a number of sectors. The award recognizes individuals from 16 different business categories for their sustainability leadership. This year, a team of four leaders at Resolute have been recognized by the prestigious Clean50 organization for the company’s significant reduction in environmental incidents and greenhouse gas emissions (GHGs), as well as environmental due diligence training, Scope 3 GHG reporting, and maximum achievable control technology (MACT) boiler compliance. As Vice President, Environment and Climate Change, Pascale Lagacé has been invited to attend the upcoming Clean50 Summit in Toronto, just like our President and CEO, Richard Garneau, did last year. This recognition is a credit not only to Pascale and team members, Jim Balik, Alice Minville and Mylene Labrie, it is a reflection of the contributions of countless people across Resolute. One of the most coveted international business awards, the ‘Stevies’, as they’re known, were created to generate public recognition of the achievements and positive contributions of organizations and working professionals worldwide. Named to the silver category of Woman of the Year – North America, Pascale impressed judges with her leadership in Resolute’s work in reducing GHG emissions and environmental incidents. The entry detailed her tremendous achievements in promoting sustainability at Resolute’s 40 pulp and paper mills and wood products facilities in the United States, Canada and South Korea, including a 70% reduction of absolute scope 1 and 2 greenhouse gas emissions over a year 2000 baseline. She also led the 19% reduction in environmental incidents in 2014 over a 2013 baseline, and oversaw the certification of nearly all facility environmental management systems to the ISO14001 standard. To learn who Pascale will be joining at the Clean50 summit, visit their web site. To see who some of Pascale’s fellow Stevie honorees are, see the list here.